Are you ready to celebrate? It’s the 20th Anniversary of the Check Out Hunger Campaign and JerseySmarts.com is joining with a band of other New Jersey bloggers to spread the word about this program. Below are some materials that I received talking about this great and worthy program. Enjoy! HILLSIDE, N.J. – Check-Out Hunger, an annual front-end awareness and fund raiser for the Community FoodBank of New Jersey, will be marking its 20th year milestone this fall. This campaign, which began in New Jersey, is run at supermarket chains across the northeast. The Community FoodBank of New Jersey reports that need for nutritious food is up 30-40 percent at its partner agencies (soup kitchens, pantries, shelters, etc) this year. This campaign was developed by the Community FoodBank in conjunction with the New Jersey Food Council and supermarket chains with headquarters in New Jersey. Currently the Community FoodBank of New Jersey administers the regional campaign with 14 chains for 32 food banks and affiliates in 9 states and the District of Columbia. The Community FoodBank of New Jersey, a member of Feeding America, distributed 35 million pounds of food in the last year to people in need in 18 of New Jersey’s 21 counties. Its staff and volunteers fight hunger and poverty not only through the distribution of food and grocery products, but by education and training, and by creating new programs to meet the needs of low-income people. The Community FoodBank of New Jersey has earned Charity Navigator’s highest honor, a four-star rating. Right in their own neighborhood. Shoppers will find a display of Check-Out Hunger donation slips at the checkout aisles in their local food stores. Right in their own home. 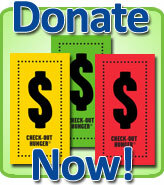 People can donate through the Check-Out Hunger in New Jersey website at www.checkouthungernj.org. Also, just a reminder that the retail partners run the campaign at varying times from late September through the end of January, with the bulk of the food stores running it in November and December. There are a list of participating stores on the website. So, folks, if you’re at the checkout counter and you see the different colored tickets like in the image above, consider donating a few bucks to help the Community FoodBank of New Jersey out this holiday season. Thanks.